In practice for more than 20 years, Dr. Leonard Harris is a leading plastic surgeon in Ontario specializing in a wide variety of procedures. With exceptional skills, Dr. Harris uses his expertise and experience to provide outstanding service to his patients, working with them to ensure they achieve their desired result. Dr. Harris has also received advanced fellowship training in Cosmetic Surgery, Craniofacial Surgery and Microsurgery. Through his training, he has also revolutionized would care by offering his patients a sutureless wound closure, a method that decreases discomfort, downtime and scarring. With extensive experience in post-mastectomy breast reconstruction, Dr. Harris has secured his place as a consultant for Dermacell®, AlloDerm® and for their SPY® Elite System as he uses their products as part of the procedure. Dr. Harris also helped establish post-bariatric weight loss body procedures in the Halton area by providing the service to his patients, and is one of the few plastic surgeons in the area who specializes in nose reshaping surgery. Dr. Harris continues to master his work through his own private plastic surgery clinic, and he works with the College of Physicians and Surgeons of Ontario to ensure the safety of private surgery clinics in the province. 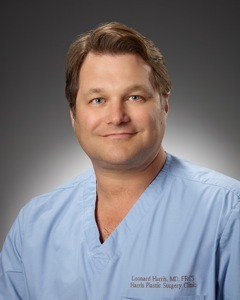 Although he is most often found at his clinic in Burlington, Dr. Harris pays it forward by being a leading advocate for women’s health issues and by using his experience and expertise to lecture internationally, as well as involving himself in various innovative, surgical research programs.